ORIGINAL GANGSTER HAS TURNED INTO OLDEST GAME WITH KING NOUGAT In american gang terminology “OG” means “origina…l gangster” and is considered to title one who has stood the test of time and weathered the storms of gangster lifestyle. Anthony Mills has changed the meaning of original gangster. “OG” is now “Oldest Game” and will open as Mills’ first solo exhibition of 2011. Mills re-defines “OG” to incorporate the theme of Chess. Thus, the centerpiece for this exhibition is appropriately titled “King Nougat. Exhibition “OG” is Anthony Mills’strategy of art and making all the right moves. As Artist-in-residence at Galleri Duerr, Mills’ painting has grown into featured collaborations with “Efter Tio” TV 4, BoConcept, OnePiece, Tshirt Store, Caliroots, AddNature, Kungsträdgården, Jazz Club Fasching, and the Stockholm Jazzfest. 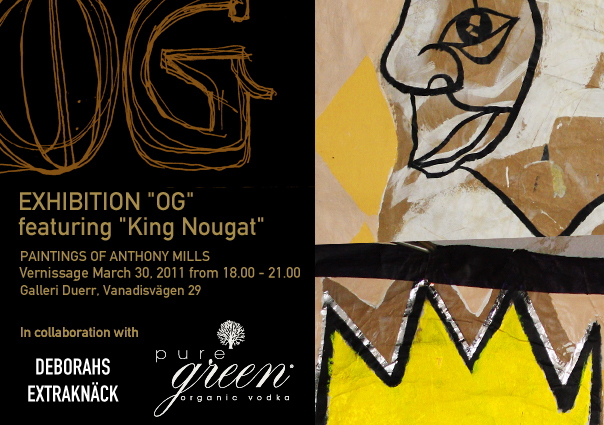 “OG” opens at 18:00 March 30, 2011 at Galleri Duerr located at Vanadisvägen 29 (corner of Västmannagatan).